Have you made up your mind to start investing in cryptocurrency? If yes, then you must be having one significant question in your mind, and that is what determines the digital currency value. The truth is that there are a plethora of factors that determine the price and value of the cryptocurrencies. Let us look at some of these factors. Supply and Demand plays a crucial role in determining the value of the cryptocurrency. You have to compare the number of coins available for mining versus the actual demand for that particular coin. Let us assume that Bitcoin has 21 million units that can be divided about 100 million times. If about 1 billion users decide to adopt the bitcoin, then it causes the price of the coin to rise to meet the demand. The political events can also have a significant impact on the cryptocurrency demand. The market dilution will also affect the value of the cryptocurrency. New cryptocurrencies are emerging in the market now and then. However, all the digital currencies do not have utility and real innovation. This is why there are chances that new digital currencies may struggle to gain traction. If a blockchain is secure, then it becomes difficult to mine the cryptocurrency. If more energy is required to mine the cryptocurrency, then this will lead to an increase in the price as well. Thus the value of the cryptocurrency eventually increases. The prices of the fiat currency will also affect the value of the cryptocurrency. If the price of the fiat currency experiences a decline, then the price of the bitcoin is bound to go up concerning that specific currency. The price of the bitcoin will go up because you will be able to get more of that particular fiat currency with the bitcoins. Node count can be useful in determining the value of the cryptocurrency. The node count is used to measure the number of active wallets that are present on a network. These active wallets for a specific currency should be searchable on the internet. What you need to do is search the node count of a specific cryptocurrency. Next, you should search for the total market capitalization of that particular cryptocurrency. The following image gives you a brief idea about what market capitalization is all about when it comes to cryptocurrency. You should compare the node count and the market capitalization with other digital currencies. There are many other advantages of the node count. When you look at the node count, then it helps to showcase the strong community of specific cryptocurrency. The node count also indicates if a specific digital currency is overbought. What you need to keep in mind is that the value of the cryptocurrency can change fast. What usually happens is that when the volume of the transactions goes up, then the volatility of the cryptocurrency drops. Secondly, if you want to assess the value of cryptocurrency on a long-term basis, then you need to analyze their everyday use. The important thing to keep in mind is that the opinion of the business leaders also affects the value of the cryptocurrency. If we look at the historical records, then we will get a clear perception of how the opinions have affected the value of the cryptocurrency in the past. Way back in 2017 China declared operations related to ICO as illegal. As a result, the value of Bitcoin experienced a collapse. The market giants may use fear of opportunity challenge. The giant financial activity acts as a catalyst for the falls and jumps in the prices. This sets the mood of the majority which finally contributes to the rise or the decline of the cryptocurrency. 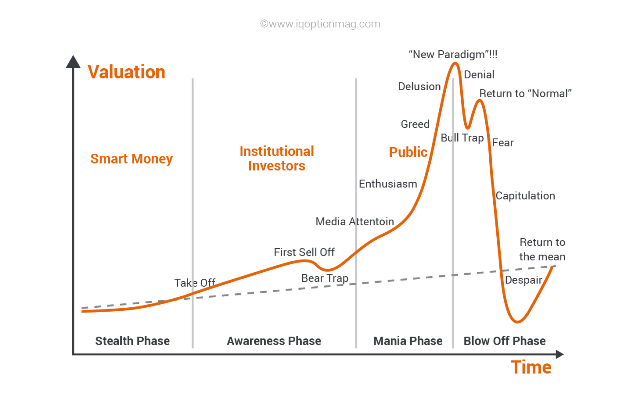 The following image explains well how different sentiments affect the cryptocurrency value. There is no denying the fact that digital currencies are influenced by the investor strategy. There are times when a depositor has a large capital. This is one of the reasons that he can buy a significant percentage of a specific token. Once the investor acquires the token, he may try to promote the reputation of that digital currency to pump up the price. When you want to determine the value of the digital currency, then you have to keep one important thing in mind, and that is the volatility of the cryptocurrency depends upon the hype. If a post is put up on a social network, then it may cause a drastic drop in the value of particular cryptocurrency. It is also vital to note that one cryptocurrency may affect the value of another cryptocurrency. For example, if bitcoin experiences price growth, then it may cause the value of Altcoin to drop. This happens because when bitcoin experiences growth, then Altcoin funds move to the bitcoin. The technological advancements also play a significant role in determining the value of the cryptocurrency. For example, if new platforms emerge in the market, they may have an impact on the overall formation of the market. The security issues are also a concern for the investors when they invest in the cryptocurrency market. They have been cases in the past when the crypptocurrency has suffered from hacker attacks. There have been exchanging closures in the past also. If a cryptocurrency suffers hacking attacks, then this may bring down the value of the particular cryptocurrency. If you are keen to invest in cryptocurrency, then you should make sure that you explore all these factors. Once the investors evaluate the factors, then they will be in a better position to assess whether they are ready to step into the field of cryptocurrency investment and trading. Make sure that you think before you take your next step.